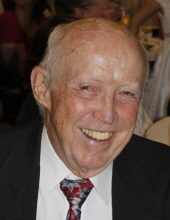 John Edward Hickle went to be with his Lord and Savior Friday, March 29, 2019, in Rolla, Mo., at the age of 88. He was born September 6, 1930, in Morse, Texas, to the late Earl and Lena (Patterson) Hickle. Raised on a small farm near Weatherford Texas, John enlisted in the United States Navy from 1949 to 1952, serving on the aircraft carrier USS Philippine Sea. He married the love of his life, Betty Jean Gore, of Oak Ridge, Tenn., in 1954, sharing 61 years of marriage until her death in 2015. John earned degrees at University of Tennessee—Knoxville and Southern Methodist University, making his career as an aerospace engineer. He worked for five years at Convair in Fort Worth, Texas, and for 32 years at McDonnell Douglas in St. Louis. At McDonnell, he helped with structural design for several aircraft, including the F-4 Phantom, F-15 Eagle, F-18 Hornet, and A-12 Avenger stealth bomber. Over the years, John and Jean were active at Berkeley Baptist Church in St. Louis; First Baptist Church Harvester (Now Waypoint Church) in St. Charles; and, beginning in 2004, Salem Avenue Baptist Church in Rolla. John enjoyed teaching Sunday School and serving as deacon. He especially enjoyed participating in church building trips through Carpenters for Christ. He also loved gardening, photography, and spending time with his family. John is preceded in death by his wife; his parents; and his brother, William Hickle. He will be greatly missed by his surviving family, which includes his three sons, John and wife, Sofia, of Orlando, Florida; Bill and wife, Debbie, of Rolla; and Steve and wife Lisa, of St. Louis, Missouri; 13 grandchildren: Adam, John, Edward, Lena, Daniel, David, Mark, Nathan, Sarah, Rachel, Sallie, Matt, and Beth; six great-grandchildren: Ben, Abby, Lily, Joanna, Eddie, and Ruth; sister Clarie Qualls, of Corpus Christi, Texas; sister-in-law Bonnie Hickle, of Austin, Texas; brother-in-law Phil Gore and wife, Helen, of Lenoir City, Tennessee; niece Becky Ford and husband, Ross, of Corpus Christi, Texas; and nephew Randy Hickle and wife, Michele, of Lubbock, Texas. A funeral service for John E. Hickle will be conducted at 3 p.m. on Sunday, April 7, 2019 at the Null and Son Funeral Home in Rolla. Interment will follow in the Rolla City Cemetery. A visitation for family and friends will be held prior to the service beginning at 1 p.m. at the funeral home. Memorial contributions are suggested to Salem Avenue Baptist Church. To send flowers or a remembrance gift to the family of John Edward Hickle, please visit our Tribute Store. "Email Address" would like to share the life celebration of John Edward Hickle. Click on the "link" to go to share a favorite memory or leave a condolence message for the family.